Out of Vietnam today, comes a story about the updated Lumia Camera app. A video shows Microsoft's Malaysian arm running the app on a Nokia Lumia 830, and displays two features coming with the update. One new feature is the fast boot up time of the rear camera, and the second is the HDR mode. This allows you to merge several images photographed nearly simultaneously, to create the "perfect" picture. Expected to be included with the Lumia Denim update, version 5 of the Lumia Camera app will bring incredibly fast speeds, allowing you to take picture after picture just milli-seconds apart. Moment Capture, which starts with a long press of the camera button, will allow some models to start filming 4K quality video at 24fps. High quality 8.3MP images from the video will be available as individual photographs. Improved image processing algorithms will allow for clearer pictures overall. The Lumia Denim update, which still could hit some Lumia devices before year end, will also include an improved Glance Screen. In addition to viewing the time, date and notifications, you will be able to choose between Bing Weather, or Bing Health & Fitness data. Also coming with Lumia Denim is the update that will allow you to wake up Cortana by saying the verbal cue, "Hey Cortana". 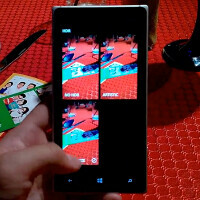 You can take a look at two of the new features for the new version of Lumia Camera, by clicking on the video below. Glad for the improvements, just hard to see exactly what impact the new shooting mode has from this video. Let's hope that it will be available real soon. That speed, love it, and that is on an 830, wanna see the icon on this app. welcome to 2014 MS Lumia..
Actually in the Camera department Lumias aren't lagging... they're leading. It reminds me the Symbian OS. We always wait the good update that will never come!!!! This philosophy is transported from Nokia to Microsoft Phone. I was a big fan of Nokia, but we need to agree that Nokia is dead. Microsoft Phone is dead before it burns. This is the iPhone era.